So doc veloclinic thinks the tour was not what he would call cleans. On top of that he speculates that judging by his analysis of climb times no new superfuels or other methods are available or at least on use. Not a very extraordinary paitsi of claims by any means. In the graphs 2013 is hilarious. So is 2009. Long live Contador & Froome. To be fair a variation of even 0.2W/kg is rather big on that level.. I would assume that if people went to big with motors, it would become rather obious.. However imagine a 60W on froome and he would fall in the range of contador in his glory years. Similar to fodder like Riis, they could make their blood like sirop... and they are just edging the competition who are not taking it to such dangerous levels. Another thing that is hard to proof is fatigue. If you don't need to go full throttle you are less fatigue in the end. I hear the commentators yell very loud, after the armstrong years, we see less people setting a huge effort!! we see people who made an effort pay the price the next day!! this means the peleton is cleaning up! Look at today... we see people doing full day efforts and not paying the price at all.. they actually seem to get better. meat puppet wrote: So doc veloclinic thinks the tour was not what he would call cleans. On top of that he speculates that judging by his analysis of climb times no new superfuels or other methods are available or at least on use. Not a very extraordinary paitsi of claims by any means. meat puppet wrote: In the graphs 2013 is hilarious. So is 2009. Long live Contador & Froome. Not sure how you draw that conclusion from the residuals chart? I posted the same link in a different thread but having given it a bit of thought I have a few issues with the analysis as presented. It's not clear at all from what's published how much normalising for length/time/stage number are modifying the basic values. Also if it's only the top 3 on GC then box plots aren't a very clear way of presenting things, and imply more data than is there (ideally I'd find a way to make one performance by one rider one point on the graph, even if the box plot was still underneath). If there are big variations in the top 3 doping vs say the rest of the top 10 then that should be obvious from the graph. If you include the top 10 (or even top 6 - I think vetooo has W/kg for top 10 for almost everything and top 6 for one other) then you get rid of the random effect of crashes and noise to some extent too - imagine how different the 2014 top 3 W/kg might be with Froome and Contador in the top 3 vs Páraud and Pinot. Overall even if it's not perfect I still think it's useful. It's funny how 2008 when the French were in charge of antidoping and caught a load of riders, vs 2009 when UCI were in charge, AICAR (allegedly) entered the fray, and Contador went thermonuclear on Verbier, are still the two extremes ten years later. Alex: yes, exactly. Illicit march would be escalating doping. If it has stalled, I take it that doping has converged to a temporary equilibrium determined by the institutional framework, testing, availability of new stuff, etc, ie it is not escalating at the moment. Even so, veloclinic would not call this clean or a sign of cleanlines per se. The direct quote says as much. I would agree. I admit to using actual footage from tdfs 2009 and 2013 as auxiliary material. Vedrafjord's point about the jump between 2008 and 2009 is a worthy one. vedrafjord wrote: I posted the same link in a different thread but having given it a bit of thought I have a few issues with the analysis as presented. It's not clear at all from what's published how much normalising for length/time/stage number are modifying the basic values. Also if it's only the top 3 on GC then box plots aren't a very clear way of presenting things, and imply more data than is there (ideally I'd find a way to make one performance by one rider one point on the graph, even if the box plot was still underneath). If there are big variations in the top 3 doping vs say the rest of the top 10 then that should be obvious from the graph. When I did my ADH climbing speed chart, I averaged the speed of top 5 ascent times for each year it was raced. meat puppet wrote: Alex: yes, exactly. Illicit march would be escalating doping. I don't understand this sentence. What is "iIllicit march"? meat puppet wrote: If it has stalled, I take it that doping has converged to a temporary equilibrium determined by the institutional framework, testing, availability of new stuff, etc, ie it is not escalating at the moment. Even so, veloclinic would not call this clean or a sign of cleanlines per se. The direct quote says as much. I would agree. I'm not sure the data tells us all that much TBH. It's all rather moot I suppose, as Clinicians tend to have a fixed view and pick out the evidence to suit. meat puppet wrote: Vedrafjord's point about the jump between 2008 and 2009 is a worthy one. Re: "illicit march". First, sorry for phrasing my point badly and also for the delayed reply. To be absolutely sure, you should ask doc veloclinic who used the phrase in the first place. To me, it simply stands for the post 2008 reality of procycling during which climb speeds of the top contenders on key occasions were a tad too close to what might be best called the epo-era. This has been documented time and again by veloclinic especially during TDFs, among others. Re: cup half full/empty. Agree that it is a matter of perception to some extent. I must sadly admit that I am on the cynics' side, here. Re: 2008/9. To me the jump between 2008 and 2009 in climbing speeds suggests that the institutional setup and distribution of anti doping capabilities amongst different players can affect the outcomes quite significantly. Moreover, had 2007 been included, the trough that is 2008 would probably have been even more dramatic. I think this was Vedra's point, as he mentioned the change in the capabilities. But Vedra can speak for themselves, of course. 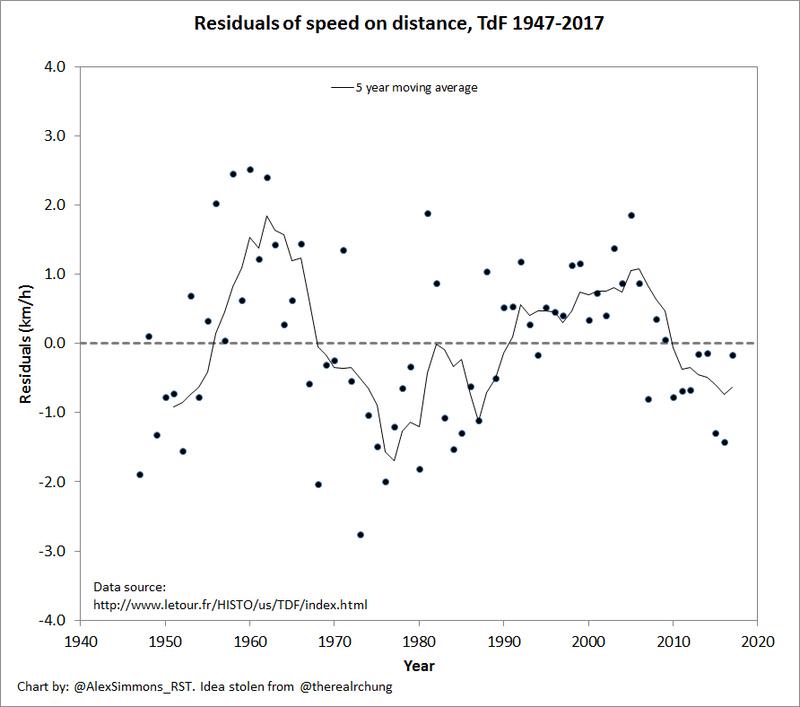 In short, whilst the 2017 Tour was second fastest average speed on record, it was actually on (actually just a touch under) the long term trend. Netserk wrote: Just for context, there actually was a tailwind on the climb today. Nonetheless, nice ride. and realised there was only one rest day. Surely the number of rest days is an important factor determining speed as well. 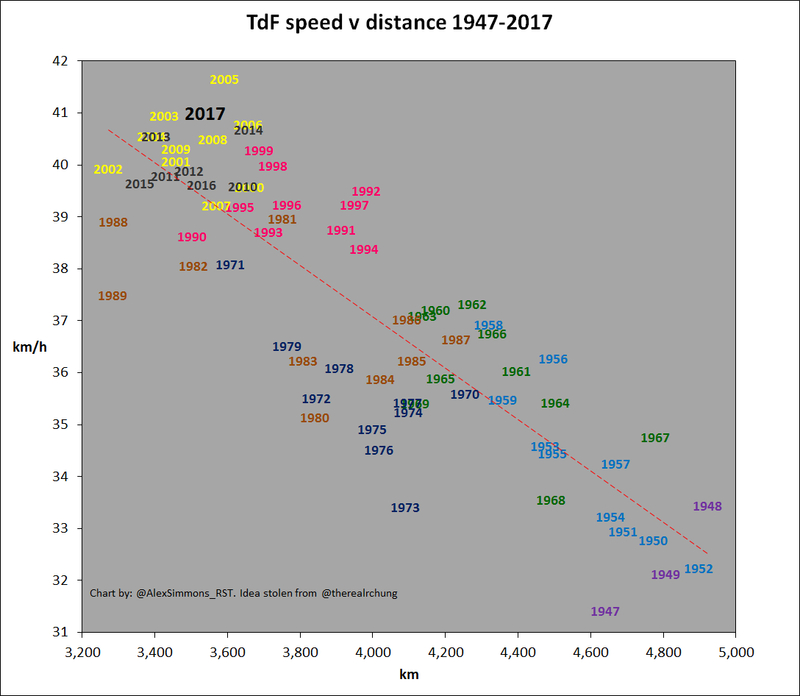 The average winning speed of each TdF is multifactoral. I think ratio of ascent metres to descent metres is probably more a factor, along with environmental conditions (e.g. ratio of head v tailwinds, heat, cold, dry, wet), road surface quality, race strategies and tactics, as well as of course the variable influence of doping. However unless I can obtain actual race routes, mapping the elevation data isn't possible to ascertain the level of correlation, if one exists. The doping question is an interesting one - it might partly explain periods of above trend speed, but it doesn't explain the periods of above trend speed when high octane doping methods were not available. So there are clearly other factors in play. There actually exists this paper which takes into account the amount of climbing at the Tour at least on some level. We studied the top ten cyclists' mean speeds in eight famous classic races and three European Grand Tours, using a previously published multi-exponential model that highlights the different progression periods of an event during the century. In addition, we measured an indicator of difficulty for the Tour de France by calculating the climbing index (i.e. the total altitude climbed over total distance)... 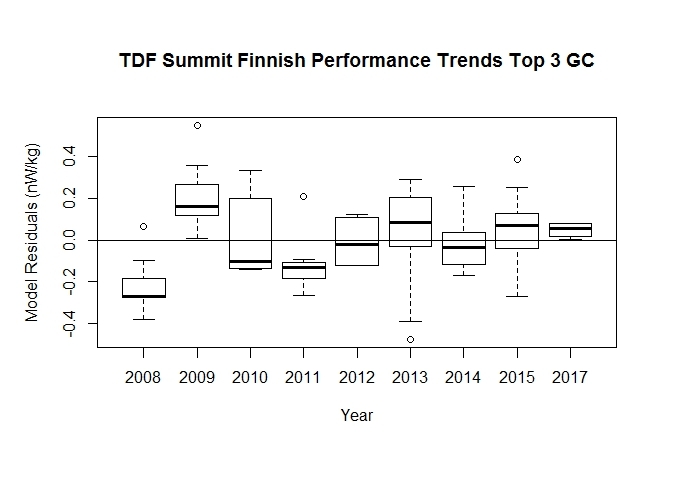 The Tour de France's climbing index also provided insight into a recent paradoxical relationship with speeds: when the climbing index increased, the winner's speed also increased. Our results show a major improvement (6.38%) in road cycling performance in the last 20 years and question the role of extra-physiological parameters in this recent progression. Aragon wrote: There actually exists this paper which takes into account the amount of climbing at the Tour at least on some level. Seems interesting, though cycling economy (mechanical efficiency) is obviously gonna vary, and making estimates of the VO2 max based on sub-max efforts isn't great. Also, they don't seem to account for the fact that RER varies a lot, depending on physiological state, intensity and even diet. It may average out at 80%, but during shorter efforts it's gonna be higher and you're gonna get more energy from the same oxygen consumption. Very fast times today. 6.5W per KG per Ferrari. Dumoulin was at 6.66 in 2015 and Froome went 7 seconds quicker. Any estimates of Najar in San Juan? Any data for the final climb in Pais Vasco today? Red Rick wrote: Any data for the final climb in Pais Vasco today? "est. power - Alaphilippe and Roglic 6.8 W/kg. Should be quite accurate. Buchmann was 21 sec slower. His power meter 409 W (7:06). Est. power 406 W."